A reader wonders why internally geared hubs haven't caught on in competitive cycling. More follow-up on a pedal-strike question, and Lennard talks about cyclocross geometry. I have been riding and racing bikes (road and MTB) for 35 years now. Like yourself and many of your readers, I have seen a lot of changes over the years when it comes to shifting. Down tube, STI, freewheel, cassette, 6, 7, 8, 9, 10, 11, 12, electronic, wireless, etc. My own experiences with all these changes have been mostly positive. My opinion is that 8-speed was the sweet spot with MTB and 9-speed for road. Enough gear selection and still a robust system that did not require a lot of maintenance. Additional cogs and narrower chains made the system finicky. Everything had to be perfectly clean and new. I feel that the gains (more cogs) were not worth it, let alone the financial cost of change. Note that I do not have any experience with electronic shifting. My first question is about internally geared hubs. I know these have been around a long time and are commonplace on urban bikes. Why haven’t these been used on our race rigs? 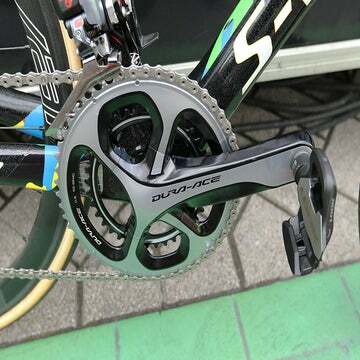 Second question; are there any new technologies on the horizon to replace the derailleur? Internal-gear hubs are rarely seen in racing due to their higher weight and their higher internal friction relative to a derailleur system. That said, internal-gear hubs are often used in races where reliability under extreme conditions gives them the advantage. One example is racing events in snowy or wet conditions at well below freezing temperatures, where derailleurs, cassettes, and shift cables can freeze up. The CeramicSpeed DrivEn drivetrain is the only technology I have seen lately that has a chance to displace the derailleur. I bought a lightweight set of road pedals and shoes. Much lighter than the SPD’s I was running. Is this considered static or rotating weight? Would a Dura-Ace TT bar extension pull shifter work on an 11- or 12-speed cassette in friction mode? I have eTap, I have had Di2, and they work great. But the old friction mode on my trainer bike sure works pretty well. It should, yes. Expect some fiddling to hit the right gear or eliminate chain noise. This might help the guy Mike who wrote in to you about tire widths and pedal strike. I have a Scott Spark that came with 27.5” wheels from the factory, and I had horrible pedal strike issues. I swapped out the wheels with a set of 29” wheels and put the largest tires that would fit on the rims (2.8” up front and 2.4” in the rear), and it’s awesome — no more pedal strike. The 29” wheels are almost half an inch larger in diameter. I run them at pretty low pressure, too (around 20psi in the rear and 17psi in the front). One last tip. My Scott has a remote suspension lockout on the bars. Before I put on the larger wheels, I’d lock the suspension when climbing up a rocky section of trail and that totally prevented the pedal strike. But yes, I understand that it’s nice to have suspension when climbing, too. A recent writer mentioned pedal strikes on his mountain bike and queried if a larger tire might help resolve the issue. I had frequent pedal strikes on my Yeti SB66c, which is a fairly low-slung mountain bike. I replaced the stock 175mm cranks with 170mm and the issue has all but gone away. That extra half-cm makes a big difference for pedal strikes but, even though I am a taller rider (6’3″, 36″ inseam), after a very short adjustment I am not affected by the shorter crank at all. Thanks for explaining several of the differences between gravel and cyclocross bikes; I’d been wondering this myself. From my experience, cyclocross bikes also may have a top tube that is contoured to be more comfortable on the shoulder and, if using cantilever brakes without internal cable routing, the rear brake cable may not run along the bottom of the top tube. I’ve heard a variety of different explanations for the difference in bottom bracket drop. Are there any other general differences in geometry given the different handling requirements? You’re correct about the cable routing and sometimes about the top-tube shape. Cyclocross bikes of a couple of decades or more ago used to have higher bottom brackets (i.e., less bottom bracket drop) than they currently do. The sacrifice in pedal clearance is compensated for by a lower seat to jump back onto, a quicker jump-off when the bike and rider run out of momentum on a sandy section, a lower center of gravity for greater stability, ease of dragging a foot on slippery corners and muddy off-camber descents, and lower body position for less aerodynamic drag. 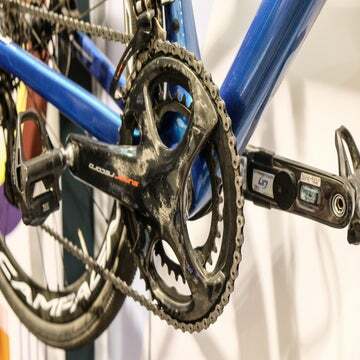 In general, today’s cyclocross bikes have a bit less than a centimeter more bottom bracket height than do road bikes, and gravel bikes have bottom bracket heights between the two but closer to cyclocross bikes. You can imagine, due to uneven terrain, why you’d want more pedal clearance on both cyclocross and gravel bikes than you would on road bikes. On the other hand, traction is so much better on a road bike that pedaling is possible sooner out of the corners and thus requires the bottom bracket height to be closer to that of cyclocross and gravel bikes than you might guess. As I said last week, while the bottom bracket height of cyclocross and gravel bikes is similar, the bottom bracket drop is different due to the difference in tire size. Otherwise, geometry differences between cyclocross and gravel bikes tend to be very subtle. You could make the argument that the higher speeds of gravel bikes would have designers put more emphasis on stability (greater fork trail) than on cyclocross bikes, which require quick handling and are ridden at lower speeds. In practice, this is generally not the case; in fact, the reverse is often true. For hours at a time of bumpy riding, handlebar height on gravel bikes is higher than on road bikes. You could make the same argument for cyclocross bikes for improved handling on tricky terrain, but you could also make the counter-argument that you don’t have to endure it long (less than an hour), and more weight on the front wheel can be an advantage. In general, when there is a difference, the height of the top of the head tube (frame stack) will tend to be a bit lower on a cyclocross bike than on a gravel bike of the same size.